Audi has unveiled the facelifted Q3, with updated engines and styling. The SUV gets more power and up to 13 per cent more fuel economy, although it will also be more expensive, with prices starting £25,340 – some £1500 more than the outgoing model. Order books open in December, with deliveries starting in April 2015. 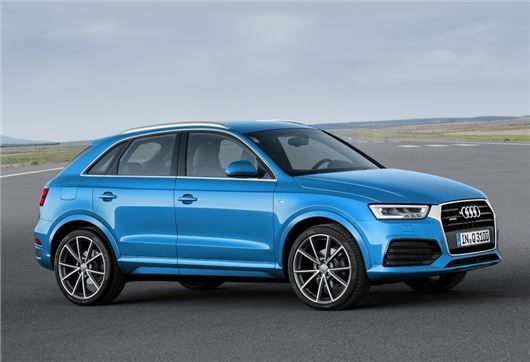 The updated engine range sees the front-wheel drive Q3 get the 1.4 TFSI engine, with cylinder-on-demand technology, which shuts down two of the four-cylinders under light loads to save fuel. As a result, the 150PS petrol engine emits 128g/km of CO2 and uses a claimed 50.4mpg when linked to a six-speed manual gearbox. Emissions rise to 136g/km of CO2 with the six-speed auto S tronic (nine grams less than the old powertrain) while fuel economy drops to 47.9mpg. The 2.0-litre petrol engine has also been reworked and now has 180PS, with the option of manual or S tronic twin-clutch automatic transmission. In front-wheel drive, the 2.0 TFSI emits just 119g/km of CO2, while returning a claimed 61.4mpg. Coupled to the quattro powertrain, the engine will return a claimed 42.8mpg and emit 152g/km of CO2, which is a considerable saving of 27g over the old unit. The third petrol unit – a 2.5-litre five-cylinder TFSI - is reserved for the RS Q3, and its 30PS power upgrade to 340PS helps propel the Q3 from 0-62mph in just 4.8 seconds. Economy is 32.8mpg, according to the official figures. The 2.0-litre diesel is available with two outputs, 150PS and 184PS, with the choice of manual or automatic transmissions. The four-cylinder diesel can be coupled with front-wheel drive or the quattro system and emissions range from 119g/km to 139g/km of CO2. Like the petrols, fuel economy is improved, with up to 61.4mpg available from the front-wheel drive diesel. Visually, the Q3 looks almost identical to the previous model, although Audi has fitted a '3D effect singleframe grille', along with revised bumpers and new look alloy wheels. Xenon bulbs and LED daytime running lights are also equipped as standard, along with a full body-colour paint finish. All Q3 models get improved specs, with Audi drive, sports seats, with four-way electric lumbar support, and a new steering wheel fitted to base (SE) models. S line versions get full LED headlights, powered tailgate and the option of sports suspension, at no extra cost, while the range topping S line plus specification adds larger 19-inch alloy wheels, privacy glass and metallic paint, along with navigation and perforated leather interior. Prices start at £25,340 for the 1.4-litre petrol with front-wheel drive (SE) and rise to £35,520 for the 2.0-litre diesel with quattro in the range topping S line Plus trim. Prices for the RS version are yet to be confirmed, but expect to pay around £44,000.